The Barnebirkie is presented by Johnson Bank & Swiss Miss. This is where Birkie Dreams begin! Imagine nearly 1000 kids skiing on Main Street to the iconic finish line of the American Birkebeiner! Kids can choose to ski either a 1/2 km, 1 km or 3 km course. 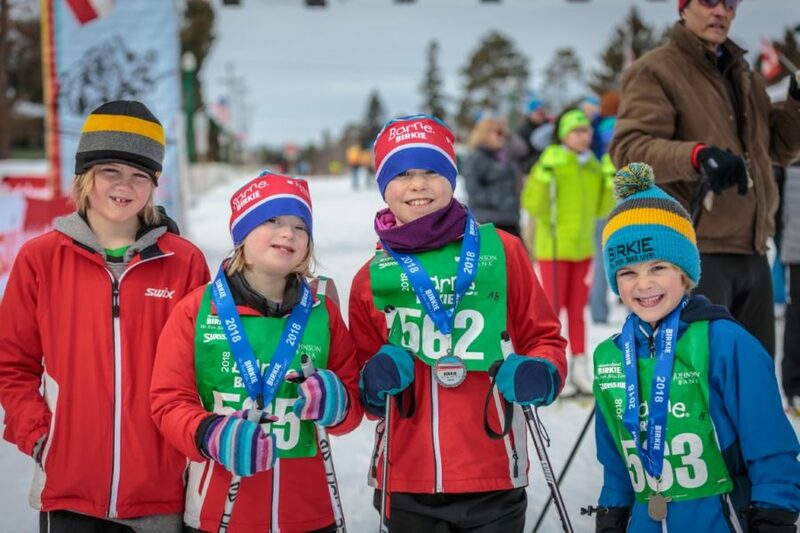 If you are looking for a competitive experience for youth, consider participating in the Junior Birkie race which will be held on the same courses following the Barnebirkie. Save money and time by registering early on-line. Barne Skiers registering for the 3 km tour will be in the Red Wave. Barne Skiers registering for the 1 km tour will be in the Green Wave. Barne Skiers registering for the 500 m tour will be in the Purple Wave. Bib pick-up and day of race registration will be from 9:30 a.m. to 11:30 a.m in the Recovery Zone tent at 5th Street and Wisconsin Avenue. Limited parking is found in the Downtown Area. We recommend parking in the Spectator Parking Lot on Hwy B and utilizing the continuous bus service from the Spectator Lot to the Registration/Start Area and from the Celebration Zone to the Spectator Lot. Any adult accompanying Barne skiers on the ski course must be on skis. Otherwise, adults must stay off the groomed ski course and walk along the paths and sidewalk. Meet your little skier directly outside of the Finish Line. Volunteers will be on hand to reunite skiers and family members. Please stay out of the direct finish line- some skiers are coming in fast! Is your school group interested in skiing the Barnebirkie? Great! Please call the Birkie Office at 715-634-5025 or email registration@birkie.com to find out how to register your group. School groups registration forms must be received in the Birkebeiner office by Thursday, February 14, 2019. The Barnebirkie starts behind the Hayward Intermediate and Primary schools and finishes at the American Birkebeiner Finish Line on Main Street. Please help ease the traffic congestion by utilizing the designated spectator parking on Hwy B. Buses will run continuously from 9:30 am to 4:30 pm from the Spectator Lot to the Registration Bus Stop, and from the Registration Bus Stop and the Celebration Zone Bus Stop to the Spectator Lot. Parking restrictions are in place on most of the downtown area streets. Please note that none of the Barnebirkie distances go over the American Birkebeiner International Bridge. Swiss Miss hot chocolate and homemade cookies courtesy of the Sons of Norway await every participant in the Celebration Tent near the finish area. 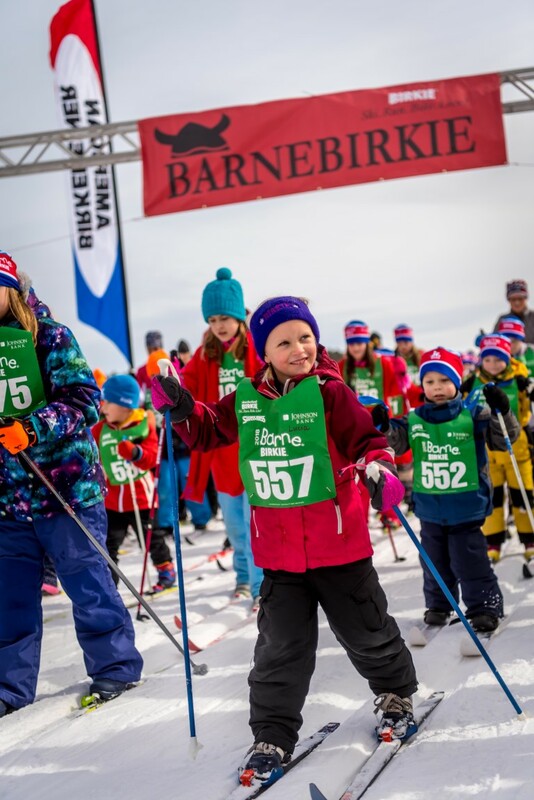 All children will receive a Barnebirkie medal, ski bib, and the first 750 children to pick up their bib will receive a ski hat.